Steady Rollin’ Bob Margolin played in Muddy Waters’ band from 1973-’80. And then 38 more years as worldwide band leader, featured guest, producer, VizzTone Label Group cofounder, author and educator. Bob is truly a bright Blue light in today and tomorrow’s Blues World. Bob won a 2017 Best Male Traditional Blues Artist Blues Music Award, and 2016 Blues Blast Magazine Awards for Best Traditional Blues Album and Best Male Blues artist for his latest album "My Road." He was a featured performer on the 2017 The Last Waltz 40th celebration of the concert and can be seen next to Muddy in the film. His “An Evening with Bob Margolin” performance art shows bring his great stories and music to clubs, concerts and overseas tours. And his collaborations with young, talented musicians, like Tyler Morris, bring the traditional and contemporary together, keeping the blues alive for generations to come. Steady Rollin’ indeed. Tyler Morris has been playing guitar at a professional level since he was 11, and at the ripe old age of 19 is about to release his third album internationally. But Tyler is not just another young musical genius - his gift runs deeper than an amazing set of ears paired with two very skillful hands. Ever since he picked up a guitar, Tyler has been driven to get to the roots of the songs and styles he learns and absorbs, and to reflect his huge and growing body of influences onto his own interpretations and eventually, his own compositions. Tyler dug deep into the blues. He began to learn the entire catalogs of Freddie King, Albert King, Muddy Waters, T-Bone Walker, Little Walter, Lonnie Mack, Junior Wells, Johnny Winter and others. Later he consumed the more modern Blues of Stevie Ray Vaughan and Jimi Hendrix. And along the way he became a strong, prolific songwriter and performer. He has had the opportunity to perform with legends and heroes including Sammy Hagar, Yngwie Malmsteen, Leslie West, Mark Farner, Ronnie Montrose, Robben Ford, Kip Winger, James Montgomery, Gary Hoey, Vince Neil, and many more. Tyler’s new album, “Next in Line,” was released in February 2018 through the VizzTone label group and Redeye Worldwide distribution. For this album, he worked with Grammy Award-winning producer Paul Nelson (Johnny Winter) and incorporated guest appearances by Joe Louis Walker and the Uptown Horns. 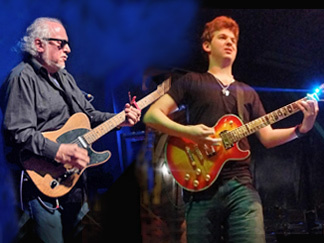 Bob Margolin and The Tyler Morris Band are the blues of today and tomorrow.